Americans tend to take a short view of history, so when Congressman Joe Wilson yelled “You lie” at President Barack Obama during his State of the Union speech, many observers reached the conclusion that Obama was the most disrespected black politician in American history. He may very well be the most disrespected president, but it’s good to recall the disrespect that other black lawmakers have faced throughout history. 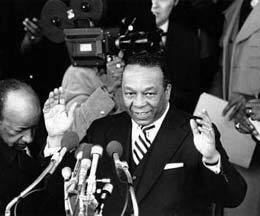 After Lyndon Johnson appointed Walter Washington mayor of Washington, D.C. on September 6th 1967, the black lawmaker faced overt racism. And like Obama, Washington, a Howard University graduate, had the credentials for the job, but that didn’t do anything to thwart the racism that was directed toward him. One Dixiecrat in Congress even took pleasure in sending Washington watermelons. Washington led a city that was torn by racial divisions, both locally and congressionally. When he sent his first budget to Congress in late 1967, Democratic Representative John L. McMillan, chair of the House Committee on the District of Columbia, responded by having a truckload of watermelons delivered to Washington’s office. The point isn’t that Obama hasn’t been the target of racist attacks, but let’s face it, these sorts of attacks are nothing new. Both political and non-political African-Americans navigate these treacherous waters day in and day out. This may be a surprising comment from a white conservative, but I agree that that the level of disrespect for President Obama is shameful. No, I did not vote for him. But he was elected and holds the office, and as such deserves the respect due that office. He is the leader of the greatest nation in the world. Calling him Barry, or Hussein, or anything else shows a lack of respect for the office and our country. Name calling is the sign of a small mind. Let’s have real conversations about the issues facing our country in a mutually respectful way. Thank you. For the record, this black woman did not vote for Obama for both terms. Cynthia McKinney got my vote for the first term. There were no good candidates to vote for the second term.